In the early and mid 2000s, we had the pleasure of working with the beloved independent label Drive-Thru Records to promote several videos. From Coral Springs, Florida to the worldwide stage, New Found Glory quickly became one of America’s most beloved pop-punk bands – and one of Drive-Thru’s most successful artists. They released four studio albums on the label – Nothing Gold Can Stay (1999), New Found Glory (2000), Sticks and Stones (2002), and Catalyst (2004) – the latter three of which were certified Gold in the US. In addition to their albums of original songs, New Found Glory released a cover EP, From the Screen to Your Stereo (2000), and album, From the Screen to Your Stereo Part II (2007), featuring songs included on motion picture soundtracks. Truly embodying what it means to be both “pop” and “punk”, they’ve put their heartfelt spin on some bubblegum classics. 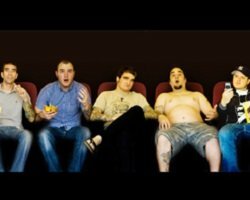 In 2007, we worked with New Found Glory and Drive-Thru to promote their video for “Kiss Me.” Originally sung by Sixpence None The Richer, NFG’s version of the song is all-out rock, and it’s paired with an equally celebratory video. They take to the stage in a makeshift mattress fort as kids are having the time of their lives at an outdoor party. With a cameo by Paramore and one young man set to tally up the girls he kisses, it perfectly embodies the freedom (and occasional mischief) of youth in the summer. In a scene where plenty of their contemporaries have either broken up or gone on hiatus, New Found Glory have been going strong for over two decades. Known for their fast songs and energetic live performances, their impact on the newer generation of bands is undeniable: All Time Low, one of the most beloved pop-punk acts of the 2010s, even took their name from the lyrics to “Head On Collision!” The band has released nine studio albums to date; their most recent effort, Makes Me Sick (Hopeless Records, 2017), peaked at Number 1 on the US Independent Albums chart. Oh, and it’s prudent to mention that their love of covers didn’t end with From the Screen to Your Stereo Part II: in 2013, they released the Mania EP, a collection of Ramones covers. New Found Glory have continued to tour consistently, including spending six summers on the Vans Warped Tour (most recently in 2016). This May and June, they’ll hit the road with support from Bayside, The Movielife, and William Ryan Key (formerly of Yellowcard); they’ll also be performing at the #ParklandStrong, a concert benefiting their alma mater, Marjory Stoneman Douglas High School, on May 16. Check out their website to see if they’ll be coming to a city near you, but if you don’t see your area listed, fear not, as NFG are always on the road. We’ve been big fans of New Found Glory from the start, and we’re thrilled to see what they do next! We can’t wait to see who becomes the next break-out artist. Do you think your video has what it takes to be the next break-out smash hit? Get in touch with Andy Gesner and the rest of the HIP Video Promo team by giving us a call at (732)-613-1779 or emailing us at info@HIPVideoPromo.com.